Time lapse video of the 2013 Snowpocalypse in the Northeast | Watts Up With That? Connecticut saw the most accumulation, with 40 inches in Hamden. At its height, the storm heaped snow on the state at a frenzied rate of 4 to 5 inches an hour. It appears Boston may fall short of the all time snow record. On the other hand, the blizzard has caused lots of trouble, and like most blizzards, death. I love this kind of stuff! I like when footprints appear then get snowed under. That must be the “manmade” part, right? I was half expecting the clock to be engulfed by the snow..
Are the marks on the pole at 12 inch intervals? This storm was the fifth highest snow total. 1978 had the second highest and seventh highest, only a couple weeks apart. Also be aware these records only go back to 1934 or so. Before that I think people were too busy surviving winter to bother measuring the stuff they were surviving. The weather historian David Ludlum described some unbelievable winters back in the 1600’s and 1700’s when Boston had over twenty storms. Right now people are worried up here about rain. There is so much snow on roofs that if the snow gets wet roofs might cave in. So you may read about people falling off roofs soon, as they are going up to shovel. Hopefully they land in a nice, soft drift. Anybody who suggest that this extreme snowstorm event is caused by global warming need to have his head slapped upside silly. There’s a marvy hoopla at Huffpost over this storm. Seems they want to claim it as the poster-child of Mannian Smarm. Anyhow, do any of these people even REMEMBER 1978?…Sheesh. I recall the Maritime Provinces of Canada (basically in the same weather system) as a child and young adult, and this was just winter happening. You dug out, and life went on. Then it stopped for a while. Well golly gee, now it’s back. More cold air bumping into the Gulf Stream. Uh, big deal. But over at Huffy, it has all the denier-haters lit up like Fukishima. You mean “effing cold!” 😉 Very cool video though. This brought two things to mind. Aside from the “Man caused this” global warming hype, the technology to record and communicate the event is much more advanced now than it was for past weather events. The news of the (was it?) 1888 blizzard was spread and preserved via engraved drawings and a few black and white photos. Nothing like the video of this post to record the event for history. The other thought is that it’s easy to forget that the local effect is relative. I lived in Texas for a year back in the ’70’s. They still talked about the winter when a major interstate was shut down. They had had 2 inches of snow. When I first heard that I was amused. Later I realized that part of Texas didn’t have the plows or piles salt or sand to keep the interstate open. Couple that with the fact that the locals didn’t know how to drive on snow and ice, then closing the road was the safe and smart call. This event is a big deal. We just don’t have the visual documentation to impressively communicate how past events were also a “big deal”. Seriously, I think the latest meme over the year or two when it comes to global warming and extreme cold snowfall events is to simply confuse the public. If it’s hot, it’s global warming. If it’s cold it’s caused by global warming. If you have a freak snowstorm then it’s caused by global warming. If it’s excessive rainfall or flooding, it’s global warming. If it’s a major drought or wildfire, it’s caused by global warming. I think these loonies have resigned to the fact that they cannot use facts to convince the public about global warming and instead choose to confuse the public anything and everything about global warming and what weather events are to supposedly have been caused by it. Even so much so that CNN Anchor Deb Feyerick blamed a near earth passing asteroid (on Feb 15) on Global Warming and asked Bill Nye, the not-so-science-guy, if a passing asteroid is an example of global warming. Simply put, everybody in on this global warming junket are throwing in their chips gambling on the fact that it’s better to confuse the public and get as little as resistance as possible when it comes to making new laws or policies governing CO2 emission through taxes, fees and penalties and eliminating any domestic sources of oil, coal and natural gas in favor of “green energy” production. Global Warming=Climate Change=Weather Anomalies. Someone help me. We are being enveloped by madness. Yesterday I shoveled for two hours, clearing the snow from atop my car, from around it and down to the end of the drive. That way, or so was my plan, when the plow came through, I’d only have to deal with the pile they left. Turns out, there was too much snow for the plows. A massive snow blower showed up this morning to clear the street. The driver and passenger were laughing and having a great time, drinking beer, stereo blasting inside the cab. They blew the snow from the street into driveways, mine included, as they passed, covering my car with another 2 feet of snow and refilling all of the snow I had shoveled yesterday. I needed the exercise, so no loss. I just finished another 4 hours of shoveling. My car has access to the street, which is now impassible because neighbors without snow tires attempted to drive up the hill and got their cars stuck sideways in the 1-inch remnants. Not one car, three! I can hear the scream of tires as I type this. Buttheads. On a related note, is the weather channel going to be the official namer of all the sub-tropical storms? A right they bestowed onto themselves? Will all of them be named after NBC-Universal characters? A little free publicity never hurts, I guess.. They need all of the help they can get. First of all a storm is a heat engine and the amount of energy it uses to move air etc is proportional to the temperature DIFFERENCE between the input and the output not their absolute temperature . Here is a simple explanation of the thermodynamics involved. Notice that if the temperature out = the temperature in the heat engine STOPS ! CO2 makes the difference less so it slows down. By spreading the heat more evenly CO2 tends to make storms milder. Despite one extreme storm recently the TREND seems to b e FLAT without any more or less storms floods or droughts and here is the proof. Mike H: It’s somewhat ironic that TWC is naming their storms after cartoon characters — descriptive of the entire effort, in my opinion. Will they name warm fronts this summer? My Brother-in-law (just north of Boston MA) just sent us pictures from this storm and pictures of the same house taken by the family after the storm in January 1948. This storm was a wimp in comparison. In 1948 the snow, shoveled from the sidewalk, is up to uncle’s shoulders who was about 6 ft. The snow on the porch roof is at least twice as high. The great snowstorm that swept the greater portion of the United States on February 7 and 8 was worse than that memorable bliizard of March, 1888, in three ways – in wind, temperature, and area affected. Only in the snowfall was the storm of 1888 greater. The wind this time averaged 60 miles an hour, against 50 in the blizzard of 1888. The temperature hovered about zero, while in 1888 it was five degrees above. Five and one-half inches of snow fell now, against 2ft then. In the area of the storm, however, is the greatest difference noted. The blizzard swept almost the entire country, instead of a mere radius of 400 miles around the city. The snow swept down on the city and took full possession. It was driven along with blinding force by a furious north-west gale of bitter coldness. It was so dry and light that it was piled up in great heaps and ridges in every sheltered point, so that snow was drifted so high in the streets that traffic on the surface and elevated lines was impeded, tanks and pipes were frozen, persons were overcome by cold, and frost-bitten noses, ears and hands were plentiful. Despatches from interior points in the State report the storm as the most severe experienced in seven years. Railroad traffic is much impeded, traffic on street railways in many cases is entirely suspended, and country roads are completely blockaded with snow. In some localities the fall of snow in the last 18 hours is reported to be as much as 3ft and everywhere the high wind which prevailed has created drifts of great size. The sharpest cold wave that has visited Chicago for 21 years made its appearance on the night of 8th February. The mercury in the office of the signal service fell to 13deg below zero, the coldest on record sinoe 1878. Only desperate efforts by hundreds of thousands of workers saved New York’s public services from complete breakdown as a result of the worst snowstorm in the city’s history. The storm lasted throughout Friday until 9pm, by which time 25.8 inches of snow had fallen – five inches more than in the great two-day blizzard of 1888 – slowing the pulse of the great metropolis to a faint beat and causing 55 deaths throughout the whole storm belt. As the storm progressed, with snow falling at a steady rate of three inches an hour, the complex transport system of the densely populated metropolitan area of New York gradually slowed down, until the only railways still moving were the subways, which carried on at reduced speed attempting to cope with the swollen crowds trying to get home. Motor cars ploughed to a standstill under great mounds of snow and were abandoned in thousands on nearly every road in the city. At one time officials of the bus companies reported 2,000 vehicles ‘lost’ – their whereabouts temporarily unknown. The storm covered an area north to and beyond the Canadian border, south as far as Washington and west as far as Ohio. While New York shivered, the temperature at Los Angeles reached a Boxing Day record of 84 degrees. The oceans, slow to respond to changes in solar radiation, surrender their accumulated heat with equal accumulated heat with equal deliberation. From the beginning of 1917 to the end of 1920 the solar constant was high, running even to two gramcalories per square centimeter per minute and averaging well above a normal of slightly under 1.94. Using the Atlantic Ocean for illustration, the primary effect of this rise in the solar constant was an increase in temperature of tropical surfaces, and, in sequence, an increase in the temperature, volume and current of the Gulf Stream. The northern arm of the stream flowed into the Norwegian Sea Eastern Arctic in increased volume and at a higher temperature. 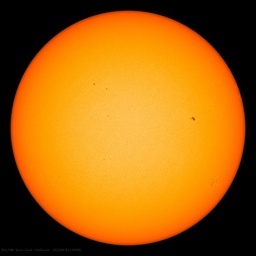 The sun in its northern tours still further aided in raising the temperature of Arctic surface waters. The Hoel expedition to Spitzbergen in the summer of 1922, sent out by the University of Christiania, reported an ice free sea as far north as 81 degrees 29 minutes, the furthest north ever reached in open water with modern oceanographic apparatus. The Gulf Stream could be traced as a surface current as far as 79 degrees, with a surface temperature of 15 degrees Celsium asainst a usual summer temperature of 3 degrees. Glaciers had melted, exposing for the first time on record open moraines; while the migrations of fish further indicated conditions not paralleled in a century. It should be noted that the beginning of these changes was dated back to as far as the year 1918. The increased flow of the northern arm of the Gulf Stream and the further heat expansion of Arctic water necessarily displaced an equivalent quantity of cold water, which pressed south, and in large part found its expansion in the cold water area which generally lies between the Azores and the Spanish coast. But the southern arm of the Gulf Stream, seeking in larger volume its return to subtropical latitudes, in its turn had the effect of pushing the expansion of the Azorean area by the year 1922 several hundred miles south and west. Sequences now appear lagging in their effects several years behind the initial cause, the rise of the sun’s heat in 1917-20. It will be noted that the average temperature of the United States in 1922 was over 3 deg. above the normal. The autumn of 1922 and the winter of 1922-23 were notable in this country for lack of rain and snow. The north-Western lows, which usually penetrate deep into the Mississippi Valley, crossed the continent near the Great Lakes, acquiring vitality only as they approached the Atlantic seaboard where, with the onset of winter, they gave New England almost the heaviest snows on record, and then raged across the Atlantic, which for six months had the severest storm period in 100 years. It has made it across the pond we near London have had enough to just cover the ground which means everything will stop trains, planes and schools/government. I’m off to work as usual. N e m o is Latin for ‘nobody’. Also a character in ‘Bleak House’, the 1852 novel by Charles Dickens. This is not normal snow, this is global warming snow, this could be termed rotten snow, thus it is dangerous snow. It is most likely very hard work to shovel it, probably extremely difficult to drive on without snow tyres or chains. It is also likely that playing with it without protection on the hands can lead to serious problems with the hands. This is unlike normal snow that is soft and fluffy and totally benign to the human condition. Thus precautions must be taken with this new perilous type of snow. The prudent thing to do is to ask our grand parents how they coped with this awful peril. I can’t compete with Hamden, after all I “only” got 30 inches of snow. I calculated I received 36000 cubic feet of snow on the driveway (that doesn’t count the area in front of the garage.) I managed to break the drive shaft of my truck. A friend brought in a track loader, looks like an Ice Station Zebra vehicle, and got that stuck. A bucket loader came to rescue, and got that stuck as well. With three pieces of equipment (not counting two trucks brought in to rescue the equipment, the driveway was mostly clear by 9:30 last night. This storm was a kitten compared to the “No Name Storm” of ’93. I was living in Maryland at the time (stationed at Ft. Meade) and the entire area was shut down for upwards of 4 days, due to the massive accumulation of snow and ice. Yes, I was living in Maryland at the time. I had moved to MD shortly before, and naively gave my snowblower to my brother, thinking I wouldn’t need it. My daughter had friends visiting that evening, and they ended up staying at our house for three days. I got more snow here this time, but we have more equipment in CT than they do in MD. Our street in MD didn’t see a plow until the third day, then one lane. It was quite a storm. now thats what i call “Winterfreude” !